Book your place on our most popular Primary CPD course! Current dates are shown below, and are led by one of our Primary RE experts; Fiona Moss and Julia Diamond-Conway. Our most popular primary course provides you with the knowledge and confidence to be an effective and inspirational RE subject leader. 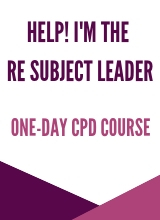 This course is designed to give you practical activities to develop your understanding of RE, and to build your leadership and management skills to effectively lead RE in your school and equip colleagues who are not confident teaching RE. Focus on creative task setting, creating a long-term plan for RE, effective and manageable monitoring and self-evaluation, and look at the purposes and aims of RE and the legal requirements. We get it! As well as teachers enthusiastically signing up for the role, we've heard of RE subject leaders who got the job because they were off sick ...or popped out to the loo! We're here to help whatever level your interest or passion for RE is. Suitable for: Primary teachers looking for guidance and support in their RE subject leader role. Perfect for both newly qualified as well as experienced teachers and any teaching staff with a responsibility for RE. Bronze members get 30GBP off (pay 145GBP), Silver members get 50GBP off (pay 125GBP), Gold members get 100GBP off (pay 75GBP), Platinum members go for FREE! Unfortunately our online shop won't apply your discount but don't worry! Just give us a call on 0121 458 3313 or email courses@retoday.org.uk and we can process this for you.